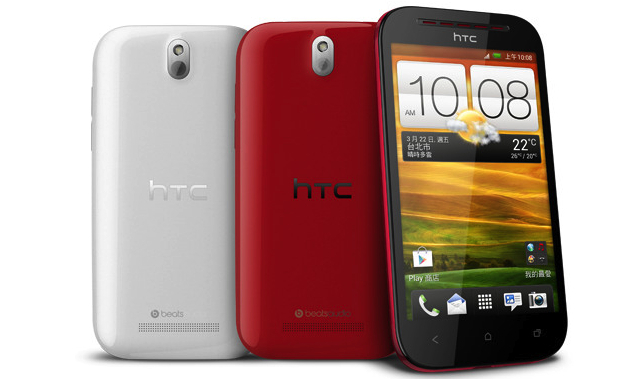 Following the debut of the HTC One, HTC has left its mid-range devices alone, preferring to subtly update its hardware as opposed to doing a complete redesign, giving us phones such as the One SV and budget Desire U. Now we’ve got another one on our hands, and it’s named the Desire P.
Sharing a very similar look and feature list to the One SV, the Desire P (seriously HTC, these aren’t good names) has shown up on the company’s Taiwanese website, and is currently expected to be an exclusive to a single network there. Could it make its way out of the country in the future? Perhaps, but HTC hasn’t said either way. So, here’s what we’re missing. The screen is a 4.3-inch Super LCD 2 panel with a 480 x 800 pixel resolution, while a dual-core Snapdragon S4 Play processor with a clock speed of 1GHz powers the phone, ably assisted by 768MB of RAM. A total of 4GB internal storage memory comes as standard, but there is a microSD card slot to give this a boost, plus the Desire P has all the usual connectivity options including GPS, Bluetooth 4.0 and Wi-Fi. An 8-megapixel camera sits on the back of the phone, and is centrally mounted on a smooth, glossy cover, which is reminiscent of the Samsung Galaxy S3. According to the spec sheet, the camera has a backside illuminated sensor, a 28mm wide-angle lens and the ability to capture stills at the same time as shooting video. All this is wrapped up in a 10mm thick, 136 gram chassis. Unlike the One SV though, it can’t connect to a 4G LTE network, and it’s not clear what version of Android the phone is running. The price for the Desire P is the equivalent of $365 unlocked without a contract.